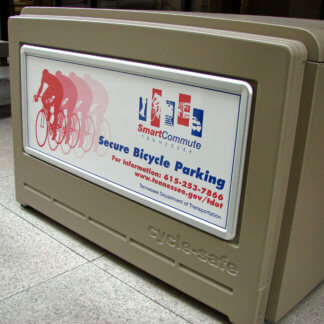 EcoPark™ Series bike lockers are CycleSafe’s economy locker, offering the quality features of our flagship ProPark bike locker series with a reduced footprint. When analyzing strength, low transportation costs, reduced maintenance expense and an estimated over 25 year design life, the EcoPark series provides a better value for bike lockers. Each space-efficient unit is comprised of two triangular stalls, forming a space-reduced two-door two-bike unit, or a one-door rectangular unit can be specified to accommodate one or two bikes. Doors and tops constructed of structural compression-molded composite with grafitti/UV-1 resistant coating, and TGIC-coated steel side panels. EcoPark units fit in compact spaces with a smaller footprint, or may be set against a wall with a single door for a one or two bike unit, or link in a row to accommodate multiple bikes.